– Revelation 18:4, a divine plea to physical and spiritual inhabitants of Babylon the Great. A two-way gate can be used for entering, or leaving: Make the right choice! During the Neo-Babylonian Empire, under King Nebuchadnezzar II, the ancient city of Babylon was the centre of trade and thus finance, religion, and military command. These three areas of internal and external ‘order’ were embodied by the King, just as the Pharaoh’s of Egypt and the Emperor’s of Rome were at the very centre of those civilizations. Cyrus the Great of the Achaemenid Medo-Persian Empire, at the head of a coalition of ‘Kings of the East’, however, in 539BC sent his engineers to divert the upstream flow of the Euphrates river, which allowed his troops to enter into the city of Babylon on the dried up river bed. Babylon fell to Cyrus in one night, without a costly siege, and without any major resistance. According to the Prophet Daniel, this fall occurred while the acting King of Babylon was drinking and feasting with his royal court, in complete arrogance, and without any situational awareness of geopolitical weakness. The Holy Bible in the Book of Revelation prophesies that this will occur again at the end-of-the-age, but that this time a city referred to as ‘MYSTERY, BABYLON THE GREAT’ the ‘MOTHER OF HARLOTS’, which sits at the centre of a financial, religious, and military empire, will be destroyed utterly with fire by ten ‘kings’. The first time around Babylon was not burnt, but this time around, Mystery Babylon is destroyed completely. The following time-lapse map demonstrates the growth of the Roman Empire, which was the archetypal BEAST on which the WHORE city will sit. “The beast that thou sawest was, and is not (abolished, but then returns); and shall ascend out of the bottomless pit, and go into perdition: and they that dwell on the earth shall wonder, whose names were not written in the book of life from the foundation of the world, when they behold the beast that was, and is not, and yet is.” – Revelation 17:8, return of Empire! “And here is the mind which hath wisdom. Shown above is the grand finale of the London 2012 Closing Ceremony, in which a Phoenix ritual was performed using the famous ballerina Darcey Bussell, four male dancers, and hundreds of females dressed in imitation of a Phoenix. This performance came directly after a performance by the U.K. band Take That, who performed a song named RULE THE WORLD! Darcey Bussell and her four male devil-sprite dancers, who handled her like multiple lovers (a harlot by definition has more than one customer), were dressed in costumes featuring flames. 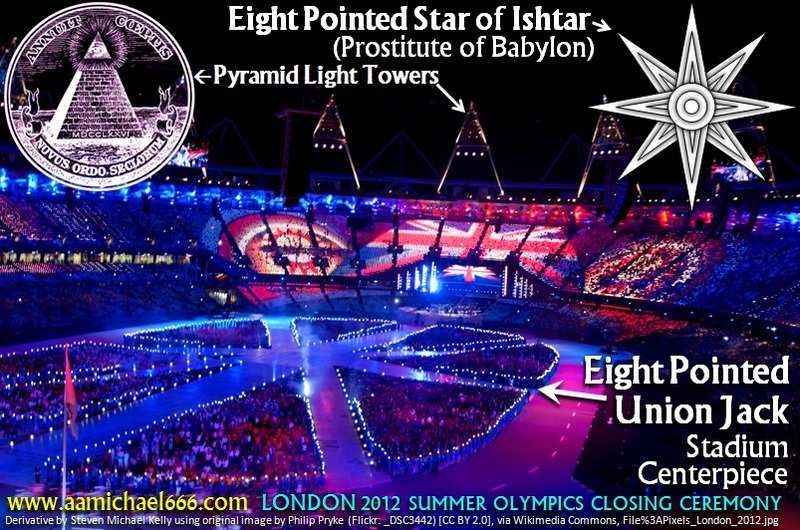 Because the stadium had been converted into a huge Union Jack, this dance was occurring in the middle of an 8-pointed star, which was the specific symbol of Ishtar, the actual ‘Whore of Babylon’. The hundreds of lesser female Phoenixes represent all the cities of the world emulating the role model financial and religious whore. The four men represent the Kings of the world committing whoredom with the Great whore at the centre of the financial system – the City of London. Perhaps 10 Kings would have been six too many for a ballet performance. At the end of the ritual, the phoenix is offered up as a tribute to the hemisphere of flame, which represented all the countries of the world on fire (each country competing was represented by a dedicated fire petal). In addition to this, Darcey was in her 44th year of life. LIBER 44 is the specific number of the highly blasphemous and satanic Mass of the Phoenix performed by Thelemites, and authored by Aleister Crowley, the most infamous person to ever emanate from London. “Ephraim, as I saw Tyrus, is planted in a pleasant place . . .
. . . Ephraim shall bring forth his children to the murderer . . . Quoted above is an English translation of the written words of Adam Weishaupt himself. For those uninitiated in conspiracy theory, Adam Weishaupt was a Jesuit trained University professor who turned against the Catholic Church (? ), and on May 1st 1776 created a secret fraternal order designed to subvert ALL Governments, ALL Monarchs, and ALL Church institutions. This order was originally known as the Perfectibilists, but it soon became known as the Bavarian Order of the Illuminati. Crowley was obsessed with Adam Weishaupt, and he wasn’t alone. Anyone looking to emulate a subversive movement for the sake of pure power need look no further than the writings of Adam Weishaupt. Upon being outlawed and exposed by the Bavarian government, Weishaupt was shielded and protected by a specific German Prince: Ernest II, Duke of Saxe-Gotha-Altenburg. This connection is highly curious, because the current dynasty of Great Britain, under Queen Elizabeth II, is the House of Saxe-Coburg-Gotha (renamed Windsor in 1917). Queen Victoria had married her first cousin Prince Albert, who was from the House of Saxe-Coburg-Saalfeld. These families are also heavily related through Queen Victoria, who was a descendant of Princess Augusta of Saxe-Gotha, a daughter of the House of Saxe-Gotha-Altenburg. There are many other connections which can be made between these Saxony ducal houses and European monarchy, but I will spare the reader a long, boring, genealogical holiday. Augusta was the Princess who married the first Freemasonic British royal, Frederick, Prince of Wales (who never became King). Frederick was initiated into Masonry on November 5th 1737, at the royal Palace of Kew, by a cadre of Masons affiliated with the Hell-Fire Club of Francis Dashwood. These men were all connected to Frederick’s very shady and controversial ‘shadow-court’. 50 years earlier, Weishaupt had principally infiltrated Freemasonry to use it as a fishing pond to recruit useful dupes from every strata of society; especially politicians, prelates, financiers, and military men. It should be remembered that at this time, monarchies all over Europe were progressively having their powers curtailed by civil governments. Electorates were emerging, and the push for universal class suffrage was building. As the British George III would soon learn in his American Colonies, the old practice of ‘taxation without representation’ would create a date with disaster, unless something was done, and fast! Augusta and Frederick were actually the parents of King George III, whom the United States would later rebel against, declaring independence in 1776; coincidentally the same launch year as the Illuminati. –Marlow, Tim. Great Fire 350 Commentary, September 3rd 2016.
and The National Theatre, as part of London’s Burning. – Great Fire 350, official event website: www.visitlondon.com [LINK]. The symbolism of ritual fire, its transformative and alchemical qualities, and its Masonic connections, can be found all over the Anglo-American world. As can be seen above, the tympanum on the southern side of St Pauls Cathedral features the mythical Phoenix; the new London rising from the 1666 ashes of the old city. However, because this is Christopher Wren’s most notable achievement, and because of his associations with the birth in London of organized Freemasonry within his era, this symbol, appearing on this particular building, has a very deep meaning for Freemasons and Rosicrucian’s. Most people have seen the Statue of Liberty in New York Harbour, which holds aloft the ‘torch of liberty’, or, perhaps, a cup of wrath and fire (? ), but how many people have paid attention to the City of London’s centrepiece monumental Corinthian column in Paternoster Square right next to St Paul’s Cathedral? 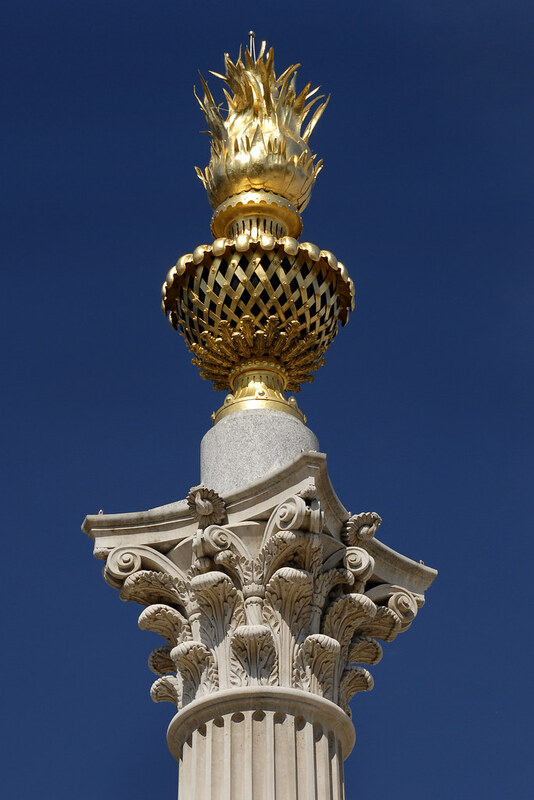 Shown to the right, this highly ornate and massive column which was erected in 2003 during the Paternoster Square redevelopment, is crowned by a gilded urn representing sacred ashes, with additional gilded flames emanating like a torch (GOOD IMAGE). This part of the city was very problematic for city developers due to various location and zoning reasons, but in 2004 the London Stock Exchange relocated to Paternoster Square, making this a highly symbolic area for City of London finance. The name Paternoster derives from the Christian prayer – ‘Our Father…’ – which prelates of St Paul’s used to say whilst travelling up and down the preceding Paternoster Row whilst exercising their rosary beads. This name was then applied to the later Square, but placing a Financial hub next to London’s pre-eminent Church, then naming it after ‘Our Father’, might be construed, by some, as a deliberate re-enactment of the Tyrian money changers at the time of Jesus Christ, under Roman Jerusalem, being licensed by the Pharisees to mint coins with a foreign god featured on them, and to change the coins directly outside the Temple; which act triggered Jesus, in his most physically assertive moment, to literally whip them from of the Temple. If London does indeed represent the financial hub of Babylon the Great from the Book of Revelation, then does this column, urn, and fire, represent the cup of fire which the ‘Mother of Harlots’ is said to hold in her hand? This harlot is said to ride upon the top of a seven headed Scarlet Beast, the leader of which is designated a specific numerical signature to identify his Empire, and its people, known as the ‘Mark of the Beast’, which number is 666. This urn, representing the Phoenix, and the high-relief Phoenix featured in the tympanum of the southern side of the very Masonic St Paul’s Cathedral, represent the 1666 Great Fire. Ashes, which are placed in urns, are comprised mainly of the element carbon, which is the element of ALL organic and carnal life. Carbon-12 atoms, which comprise 99% of all carbon isotopes, are composed of 6-Protons, 6-Neutrons, and 6-Electrons, making them the symbolic ‘666’ element of ALL organic and carnal life. The New Testament character known as the Antichrist, known also as Abaddon, and Apollyon, is only mentioned by name once in REVELATION 9:11, and is said to destroy greatly with fire, but what he desires the most is to tempt the carnality of mankind so that we deliver him our souls. It is no coincidence that the pre-eminent place which will benefit from the trade of Carbon Credits, and Carbon Market Derivatives, will be the City of London and its Crown offshore tax haven network (secrecy jurisdictions). This great city at the helm of a behemoth bearing the word ‘Great’ in its name – Great Britain – was literally birthed in the 1st Century after Christ, by the Roman Empire, at the exact same time as ancient Babylon was being completely deserted, so that by 117AD when Emperor Hadrian conquered Babylonia, he could comment that it was merely a pile of rubble and ruins. Babylon wasn’t burnt, but was slowly deserted, yet it had once been the largest city on Earth. In 117AD another city was on the rise in Britain – a truly Roman one – and for just over one year the two geographical locations were held under the same Sovereign; the Roman Emperor. 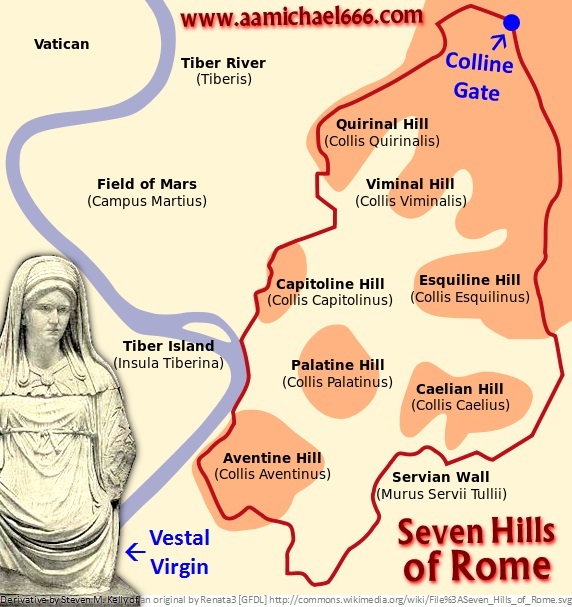 This year also marked the territorial high point of the Roman Empire. Later on, the 1666 Great Fire of London literally demarcated the era of the decline of the Holy Roman Empire, but also the exodus of Puritans towards America, and also the birth of a truly Naval British Empire. This new Empire, whose soldiers would wear scarlet – known colloquially as the ‘red coats’ – just like ancient Roman soldiers, would play the continental powers – which comprised the old Roman Empire – one against the other, all the while positioning itself through colonialism to become the financial centre of the entire world. Coincidentally, the Venetian maritime republic, which was really an Empire under an elected Doge, was waning at about this exact same time; one wonders whether vast amounts of free capital, bloodlines, and esoteric traditions had secretly migrated to the City of London at this time; this might even have begun about the time of Queen Elizabeth I, but this is a long story for another day. The famous symbol of Venice is the Lion of St Mark, which is a ‘Lion with Eagle’s Wings’, which is holding a book in its paws, and which has a very human looking face. Similarly, the symbol of Great Britain is the Lion, and the symbol of the United States is the Eagle. Thus, Anglo-America taken as one geopolitical unit, is symbolically a ‘Lion with Eagle’s Wings’. In 1776 the Eagles Wings were plucked from the Lion, but it would seem that subversively the Lion had a plan to get them back, called the Gold Standard and the Federal Reserve System. New York City might have the world’s largest equity market, but since the large companies founded in America have become largely independent of U.S. Regulators, and as they have launched themselves as true multi-nationals, they – and their owners – have now been dovetailed into largely offshore wealth networks which require regulatory havens in order to avoid tax and transaction scrutiny. Thus, they have gravitated back towards London and its offshore Treasure Islands, which is literally what these are; a global network of pirate ships with no allegiance to anyone except the Crown who shelters the profitable side of their operations. Once the American multi-nationals had migrated to the offshore zone, it didn’t take too long for United States governmental functions to come under the sway of this money through corruption and the associated shifting political realities. Now there is only one solemn rule in Anglo-American relationships: The offshore Empire that is spiritually and legally anchored in the City of London, calls the shots; any nation or individual who existentially threatens this state of affairs is targeted for destruction (ie, Saddam Hussein, Muammar Gaddafi, Bashar al-Assad, and Vladimir Putin). Even the Vatican in Rome has become reliant on this offshore complex to remain solvent in the hyper-fiat universe that the City of London has pushed to create. Without the Cayman Islands operations, the Vatican would be in serious financial problems, because it’s vast wealth in real-estate and art, is highly illiquid. Around the world, wealth from productive sectors are siphoned off into this offshore complex through highly rigged market mechanisms, using paper games and dark-pool operations. This offshore complex is most responsible for propelling world economics into the currently emerging global depression, and what is causing most of the trade deflation globally; a parasite killing its host. Nothing can seemingly stop the paper tigers that accountants and corporate lawyers operating in this offshore zone can attach to this growing octopus, and now they want a carbon trading technocracy to manage as well! They want TOTAL WORLD CONTROL, and nothing less. down, will be expanded and improved within the next week. will be updated in a week or two. Please check back later. Now for some quick information on the Burning Man Festival. ABOVE: A satellite image of Black Rock City during the 2011 Burning Man festival. Three bearings are indicated to show the amazing closeness of the official souvenir art map upper meridian line to the direction of the Kaaba, in Mecca. All of the souvenir art maps between 2001 and 2015 were aligned with the 12:00 city ‘time’, whereas the 2009 and 2011 maps were aligned on a slant. Interestingly, the 2011 map is of extreme significance, because the upper meridian is aligned with a 11:09 city ‘time’, whereas a Great Circle drawn to Mecca would have been the equivalent of 11:12 city ‘time’ (this can be worked out from the above bearings). This 2011 map meridian was aligned within approximately 3.5 minutes (1.75 angular degrees) from a true Mecca bearing! Also, this 2011 map is importantly the only ever map to be featured inside a pocket watch – a clock! – but even more damning is the fact that the theme of Burning Man 2011 was ‘RITES’, and one of the main ring roads was named HAJJ! No Islamic festival what-so-ever has ever shown up on any other Black Rock City road layout scheme or map. Incredibly, in August 2011, the Mecca Clock Tower was also officially opened 7 days before the beginning of this Burning Man 2011 festival, so the map was produced with multiple hidden informational inserts highlighting this fact. I cannot explain how impossible the odds would be for all of this to be an accident. ABOVE: A screenshot from the webpage of the long time graphic designer of the BRC art maps, Lisa Hoffman, listing her portfolio of map designs from 2001 to 2015. Lisa did not produce the 2016 map, because she has now handed the design role over to someone else. Incredibly, the icon which appears in browser tabs at the top of her website, is a Black Cube; an homage to the BRC Kaaba fascination? Click on the image above to go to Lisa Hoffman’s webpage. If you made it this far, then thanks for reading, and I hope this somewhat disparate information has been mentally connected in a constructive manner. Sometimes it is just the seeds which are planted in the human mind which are important; as they grow, they reveal their true importance to the bigger picture, but we need to give them time to grow – especially when the subject matter is so esoteric in nature. This post is incomplete, and will be updated over the next week. I thought I would post it early however, because I know my readers will find the first half very interesting. The second half regarding Black Rock City and a possible human sacrifice at Burning Man 2001 (possibly connected to the Twin Towers attack which happened only days later), will be completed within a week or two. Please check back later for more info! © 2016, Steven Michael Kelly. This website is purely a non-commercial pursuit of the author, justified by the universal principles of free speech that western society was truly progressed and founded on. This freedom is under critical attack by agencies such as the United Nations, under the guise of ‘political correctness’. If this process is allowed to continue unopposed, we will truly enter into a new dark ages to make a Roman Pontifex blush. All articles are backed up on archive-dot-org. If you would like to privately backup this article, please feel free, especially if this site is taken down, in which case I authorize site mirroring to be setup. If you would like to quote this article, please feel free, however if you would like to use images or sizable sections of it, please contact me for permission, and provide some context for your interest in it. Images may be copyright where stated, or under a Creative Commons Share-alike license where stated. Images taken from TV, movies, books, magazines, websites, publications and other forms of media, are low resolution, for informational and non-commercial purposes only – this use is justified under FAIR USE principles, for commentary and discussion.